Sarah is an award winning bridal designer renowned for simple and uncluttered elegance and subtle detailing. All of Sarah’s dresses are created in the English countryside from fine fabrics and delicate laces, with tiny details that add elegance and allure. You can choose from the bridal collection, and have the dress made to a standard size in the colour and lace of your choice. 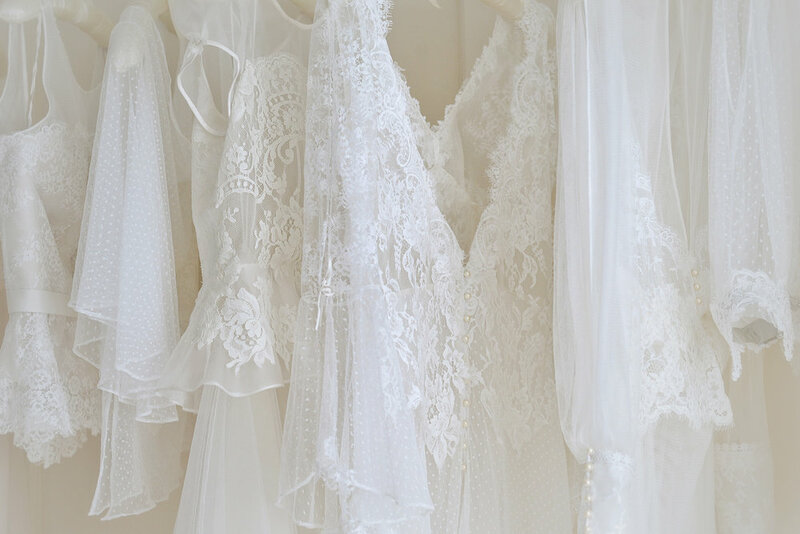 There's a whole room of wedding dresses and bridal separates to try on, all in Sarah’s signature style. Tiny pearl buttons, delicate hand dyed lace appliqué, and light catching crystal beadwork are all mixed to create soft and pretty dresses and bridal separates in the most beautiful fabrics. Dresses can then be altered to fit perfectly by our in house team. What if you love our style of dresses, but can’t find the dress that would be perfect for you. Perhaps you’d like a dress with sleeves, in a different colour, or in a different fabric, or with a different neckline etc. ? Our bespoke service allows you to customise the design of a gown to make it your own. As all our dresses are made locally details can be changed very easily to create the dress of your dreams. It’s possible to make simple design changes, and even combining the designs from two dresses, such as the top of one and the skirt of another into a beautiful gown. A bespoke dress is made to measure so will fit and flatter perfectly. What if you have an idea for a dress and simply cannot find what you are looking for? Or you would simply love to know that you will be wearing a very special “one of” a kind dress. Or you’d like your own design created from a sketch on a blank piece of paper. A Couture dress is a luxury; it's the chance to wear a beautiful handmade garment, designed just for you, that is cut to flatter your figure and fit you perfectly. You may have fragments of ideas that form the start of a dress; images from childhood, from dreams, from a time period in history, from style icons. Our skill is to capture these ideas and use them to create a tasteful and stylish gown that reflects your personality. You can also choose from an extensive range of luxurious fabrics including silks, lace and velvets; browse through boxes of trimmings; tip out jars of pearls, beads and Swarovski crystals and let your imagination run wild. It's fun! We only make a limited number of couture gowns each year so it's advisable to book early. For further information click here.